Whether you’re looking for a tasty snack or a dish to take to a potluck or party this recipe is always a hit. This is Easy Corn Salad Recipe is quick to whip up and is ready to eat as soon as you make it. That’s why it is so great to make for parties or for a spur of the moment get together. This dish is known as a summer dish but I make it well into October! I love how refreshing and crisp the ingredients are and even though it may not be summer, your senses will definitely take you back there! No matter the season this dish made with crisp veggies will bring you back to summer. In large mixing bowl combine black beans, black eyed peas, onion, corn, tomatoes, and bell peppers together. Mix together olive oil, red wine vinegar, sugar, and chili powder. Pour over salsa mixture and stir to coat evenly. 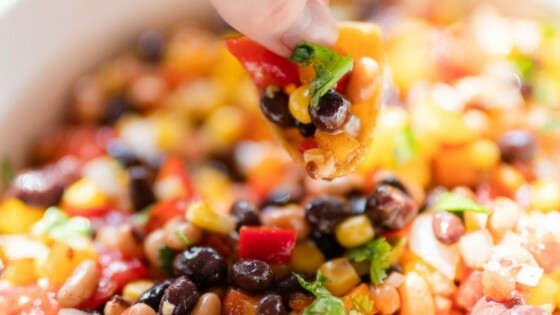 Serve with corn chip scoops or tortilla chips. Store in air tight container and keep refrigerated. I loved this recipe! Thank you! looks delicious! can’t wait to try it. thanks.